Home >> Our Providers >> Hugo D. Ribot, Jr., M.D., F.A.C.O.G. 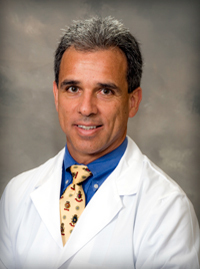 Dr. Ribot is a Board Certified physician in the specialties of obstetrics and gynecology, and advanced operative laparoscopy, and the managing partner of Cartersville Ob/Gyn Associates. A 1981 graduate of Dartmouth College, Dr. Ribot received his medical degree from the University of Miami School of Medicine in 1986. He completed his residency in obstetrics and gynecology at Emory University Affiliated Hospitals in 1990, receiving its first-ever annual “Best Laparoscopic Surgical Resident Award.” Since joining Cartersville Ob/Gyn in 1990, he has introduced to the northwest Georgia region numerous advancements in the specialty. Dr. Ribot also is the founder and medical director of the practice’s onsite outpatient surgical facility, the Georgia Advanced Surgery Center for Women.